If you are in the wedding planning process and have been scouring Instagram for #weddinginspo, you may have noticed that "wedding hashtags" are an increasingly popular trend. Gone are the days of leafing through plastic-covered wedding albums pages. Now we are living in a digital world full of heart emojis and scrolling through newsfeeds! If you aren't social media-savvy, a hashtag is a word or phrase that begins with a pound sign (#). It's a way to categorize, or group, photos together on (mainly) Instagram and Twitter. When seeing a hashtag, you would click on the phrase (which is a link) and all the public photos that use that hashtag will pop up on your news feed. The way the "wedding hashtag" trend works is that the couple comes up with a creative phrase that represents their love and asks their guests to use it in the photo caption when they upload pictures onto their social media accounts. It is also an innovative way to compile all of your wedding day photos taken by different people from various points of view (someone might want to get Grandma a smartphone before The Big Day!). But how do you come up with a hashtag that is so distinct that it will set your photos apart from the sea of other celebrations? 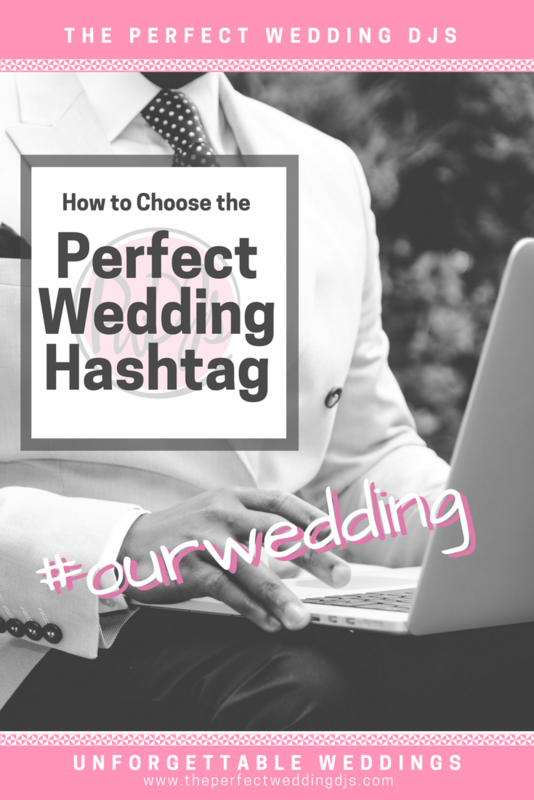 Here are some tips for coming up with the perfect hashtag for your social media wedding album, and how to spread the word to your guests, as well. Ask your friends and family closest to you what they think would be a fun phrase that best represents you and your partner. Sure, your Great Aunt Edna may have no idea what you are talking about (#hashwhat? ), but for the tech generation, this will create even more excitement for the occasion! Make it into a game at your Bridal Shower or take a poll at your Bachelor Party. Your guests will appreciate you asking their input, and you will be sure to have a few laughs in the process. Did you drain all of your creative juices while planning the flower arrangements or choosing the DJ playlist? That's ok -- just use your names! It is the easiest way to go. "#katieanddanswedding", or "thenewobriens" are some combinations that work. Or, you can be like the celebrities and blend your names in a portmanteau (for example, Steve and Annie could have a hashtag like #stevanniesbigday). Just make sure there isn't already an existing hashtag out there, or else your wedding photos may get mixed up with another couple's from halfway around the world! Prepare your guests for your hashtag by including it on your invites, printing it on the cocktail napkins or making a pretty sign that they can read when they walk in. Don't forget to tell your DJ emcee about your idea, as well! They will be sure to remind the guests to tag their photos when they upload them. Explain to your family and friends that this is an important part of the celebration for you. You are inviting them to be a part of capturing those special moments that the photographer may have missed! This certainly is a fun trend to incorporate into your wedding, but you also don't want your family and friends to be glued to their phones. Encourage them to upload the photos after the ceremony and reception so they can enjoy themselves in the moment. And that goes for you, too! Don't carry your phone in your garter or inside your jacket pocket. Technology is wonderful and a picture is worth a thousand words, but nothing will replace those special moments that you can see with your own eyes. "I had Perfect Wedding DJs for my graduation party and they were so good! Everyone had a good time and these DJs really know what to play and how to get everyone included on the dance floor. They don't just play the modern hits but they also do an awesome job integrating a mix of old school and making sure everyone is having a good time. I definitely recommend these DJs for your next event. You won't be disappointed!